I begin my day at 5:15 during the week, and I’m usually on the road by 5:45, taking the Western Bypass to get to work. While I do have to contend with the closely placed robots in Randburg and Strijdom park until I get to the highway, further complicated by the usual reckless behaviour of taxis stopping in places that are as inappropriate as they are dangerous, the drive suddenly changes once I’ve taken the sweep of concrete that is the on-ramp onto the highway. This morning my car was limned by the light of the full, perfect moon. Hanging just above the horizon, serene and pockmarked, it soon was behind me as I drove towards the sunrise. Every morning I drive towards the sunrise, the sky lightening above the carpet of lights, a few clouds hovering unsure above the bands of rising colour that make up a Joburg sunrise. By the time I get into the office, there’s that particularly fresh sunlight that makes everything look new, like pollution doesn’t happen and all those cliches about each day being another chance suddenly seem to have some truth in reality. It is something I never thought I would appreciate, but I never tire of the ribbons of red light that run along the curves of the highway before me, the bright lamps of the cars going the other way. There’s something beautiful about the shared energy, of all the people going to work, all of us commiserate in our early hours and joining the sun as it begins its day. In the little bubble that is my car, as I make my way to work dressed like a real grown-up, earning my own money and paying my rent, it feels like each morning’s drive is an opportunity to think and appreciate, to see the city as magnificent as any natural landscape, vibrant in all the energy that flies over its surface in the people that populate it. All of us that drive together, we share this landscape, the flung-out horizon lit by the sun and lamps and the moon at the same time. Its the urban pastoral, it is my wondrously crazy and mad and exciting city, and sometimes I feel like it is offering me all of its potential when I crest one of the hills that the highway follows and it is laid before me. With the autumn leaves that simmer orange and umber against the iced blue sky of a bright winter morning, with a coffee in my hand and a scarf draped over my coat, I feel like I’m starting to live the New York dream right here in my city. 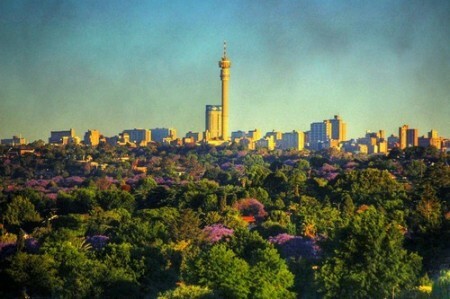 Because Joburg is resplendent in all its jacaranda trees, its skyscrapers, its hubs of business, and never pretended to be perfect. It is a town built on gold and struggle, with a short past and a lot of work to do, but we’ve always known that. No one ever pretended that Joburg didn’t have some ugliness to work through and blood to drain out, but there’s little to match the potential and the drive and ambition. It is a joy to drive through at night, or on a quiet afternoon in December, and particularly heart-stopping during an October sunset, when the purple blossoms sing against the oranges and pinks. And while traffic can make me want to drill a hole in my head to drain out the frustration, I’ve been on enough detours and lost often enough to always be surprised at the hundreds of little places that only seem to appear when I’m not looking for them. 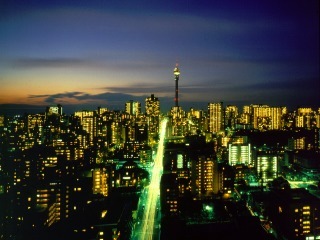 Joburg is hard on the body, a never-ceasing stream of noise and light and people and sights and news and violence and money and joy and general bolshie behaviour. But its mine, it gives me the energy and opportunity to feed my ambition, a city that will reward the brave and the cunning. And driving through it is a reminder of its promise each morning.